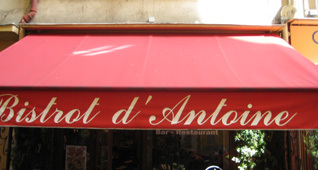 Opened, in November 2007, Bistrot d'Antoine has quickly become one of the most popular places to eat in the Old City of Nice. And there are many good reasons for this. Armand Crespo from the "Cigalon" in Valbonne, changed the mood of the restaurant and refreshed the walls giving the restaurant a pleasant modern bistro feel. The bistro has both upstairs dining and a steet terrace. The restaurant has an excellent menu (see sample below), and a very reasonably priced wine list. Be sure to try one his excellent made risottos which are served as a main course . 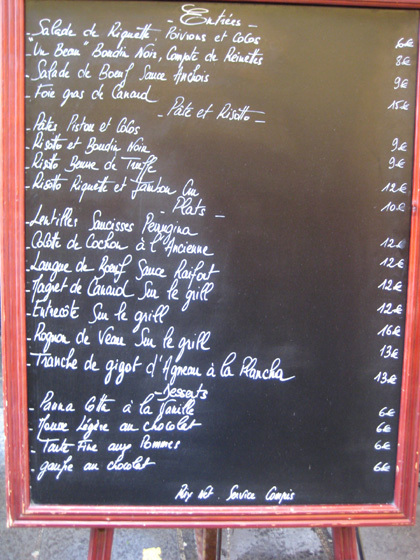 Bistro d'Antoine now has a sister restuarant called Le Comptoir du Marche located a few blocks away at 8 rue du Marche. The restaurant is however smaller and lacks the atmosphere but the food is excellent.